Neuroblastoma (NB) is the most common solid tumor found in children. It starts in some very early forms of nerve cells found in the embryo or fetus. Amplification of the gene MYCN is a well-characterized genetic alteration in NB and is directly associated with advanced disease and poor prognosis. Besides MYCN amplification, several other genome alterations in NB have been reported. 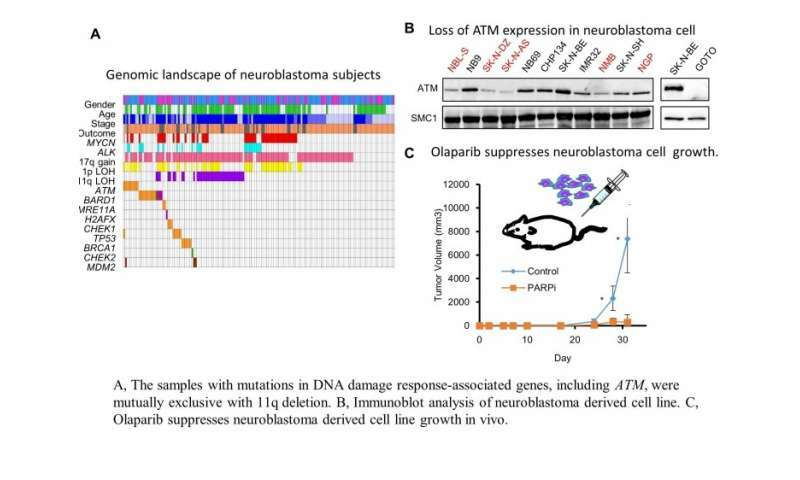 Notably, deletion of the long arm of chromosome 11 (11q deletion) is one of the most frequent events in aggressive neuroblastoma. In the past two decades, despite extensive efforts to identify the genes associated with 11q aberrations in NB, definitive answers are still unclear. This distinct gap in the field has spurred a team of Tokyo Medical and Dental University (TMDU)-centered researchers to investigate the role of the gene ATM and DNA damage response (DDR)-associated molecules located in 11q. A report of the results was recently published. "The protein ATM, encoded by the ATM gene, is a master regulator of DDR crucial for maintenance of genome integrity. When DNA damage occurs in genes that play a crucial role in the DDR itself, the checkpoint pathway is compromised, contributing to the formation of cancer," explains Masatoshi Takagi, lead author of the study. "Among 237 fresh tumor samples from the patients, we found ATM, MRE11A, H2AFX, and/or CHEK1 gene loss or imbalance in 11q in 20.7 percent of NB, 89.8 percent of which were stage three or four cancer." Furthermore, nearly half of the samples had a single nucleotide variant and/or copy number alterations in those genes. ATM-defective cells are known to exhibit dysfunctions in DNA repair, suggesting a potential for PARP inhibitor, a commonly used targeted therapy for patients with BRCA mutated ovarian cancer, to arrest NB growth. Indeed, the team found 83.3 percent of NB-derived cell lines exhibited sensitivity to PARP inhibition. "There is much more to uncover, such as how and when the mutation of DDR-associated molecules, or loss of 11q, occurs during tumor development and progression. Additionally, it will be important to compare the frequency of mutations in DDR-associated molecules or 11q loss between initial samples and relapsed or metastatic region. "Nonetheless, our present results further support the possibility of PARP inhibitor as a promising therapeutic approach for specifically targeting NB due to defects in the series of interrelated pathways that function in the repair of DNA breakage." Based on those finding, Tokyo Medical and Dental University has launched phase I clinical trial using olaparib for refractory pediatric solid tumors.